I was browsing the tea shelves at an Asian Supermarket recently because I was looking for teas that have diuretic properties. I had read that ginger was a natural diuretic, so I bought some ginger tea, also a ginger and green tea mix. I also bought Noni tea, and Gymnema Sylvester tea, which have sugar lowering properties. I also noticed guava tea, and wondered what guava tea was good for. Guava, the fruit, is rich in Vitamin C, richer than an orange in fact, has high fiber content. The leaves are boiled to treat diarrhea, and the leaves also have anti-microbial and sugar lowering properties. The next time I am at the supermarket, I will definitely get myself some guava tea! The only thing I am worried about is that the tea may cause constipation! apa kelebihan teh jambu tok? ?setahu aku air daun jambu kena mandi indu lepas beranak awak ka luka jampat gerai. Pat, this is what I read pasal guava. Very, very good benefits! * Guavas are an excellent source of vitamin C and also contain iron calcium, and phosphorus, the guava contains the highest vitamin C content out of all the citrus fruits with as much as 180mg per 100g of fruit. * Older children and adults, a cup once or twice daily of a leaf decoction is the tropical herbal medicine standard. 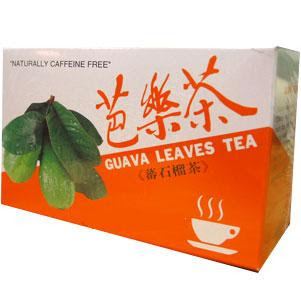 * A guava leaf decoction is taken to relieve colds and bronchitis. * The roots, bark, leaves and immature fruits, because of their astringency, are commonly employed to halt gastroenteritis, diarrhea, dysentery and vomiting in cholera patients. * It also has hypoglycaemic and anti-bacterial properties. The fruit, when eaten whole helps reduce both, high blood pressure and cholesterol levels. * Guava benefits is it battles diabetes, Combats cancer, Protects prostate. * Guava can improve your heart health by helping to control your blood pressure and cholesterol.